You can also call 417-326-6003 to request prescriptions by submitting a refill request by phone directly to the pharmacy for processing or to talk to a pharmacist. At Butterfield Pharmacy, we can help you save money on your prescriptions by letting you know if a generic medication is available and if it is the right choice for you. 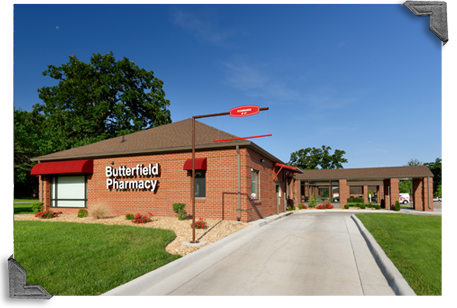 Our pharmacy is conveniently located near Citizens Memorial Hospital and other medical clinics, Butterfield Pharmacy offers friendly, reliable and convenient service. We even have a drive thru for your convenience. Our community-based pharmacy accepts most major insurance plans. Call 417-326-6003 to fill a prescription, transfer a prescription or talk to our pharmacist. Hours of operation on the weekends may vary in the future.